After the success of the Rio 2016 Olympics and the 2014 Football World Cup, Rio is a transformed city; cleaner, safer and with improved infrastructure. The easiest way to see the city is with an organised full day tour which cost from around R$300 (£75) and can be booked via most hotel concierge desks or receptions. Whilst those wishing to do only one or two sights may opt for taxi, note that Uber is as, if not more, expensive than the local taxis which cost around R$25 for a 5km ride. Located on a peninsula at the mouth of Guanabara Bay, this iconic mountain is named due to it’s resemblance to the traditional shape of concentrated refined loaf sugar. 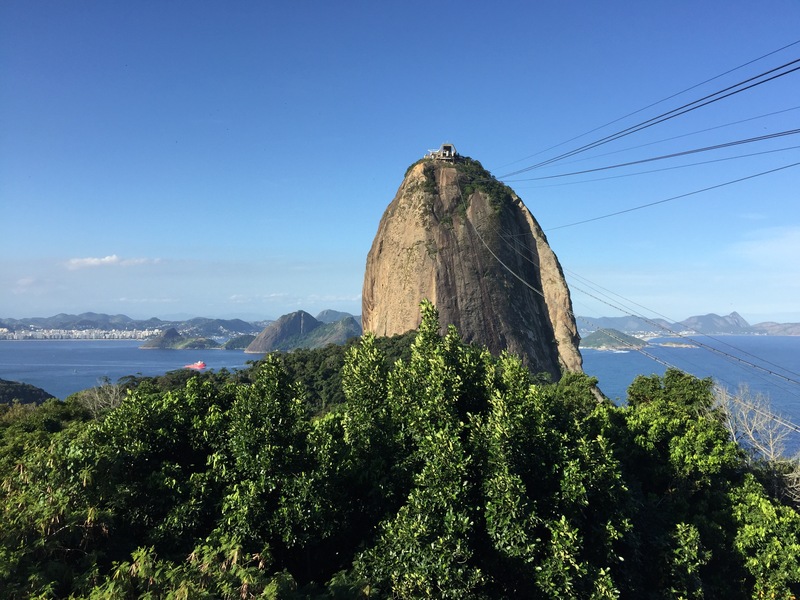 It actually consists of two mountains, Sugarloaf and Morro da Urca which are connected by a cable car which runs every 20 mins which reaches 396 m (1,299 ft) above the harbour on the main Sugarloaf peak. The mountain is know worldwide for its cableway, panoramic views of the city and having featured in the James Bond film Moonraker. Entrance of R$72 (adults) was included in our tour price. The iconic of Christ overlooking the city of Rio was completed in 1931 is located at the peak of the 700-metre (2,300 ft) Corcovado mountain in the Tijuca Forest National Park. 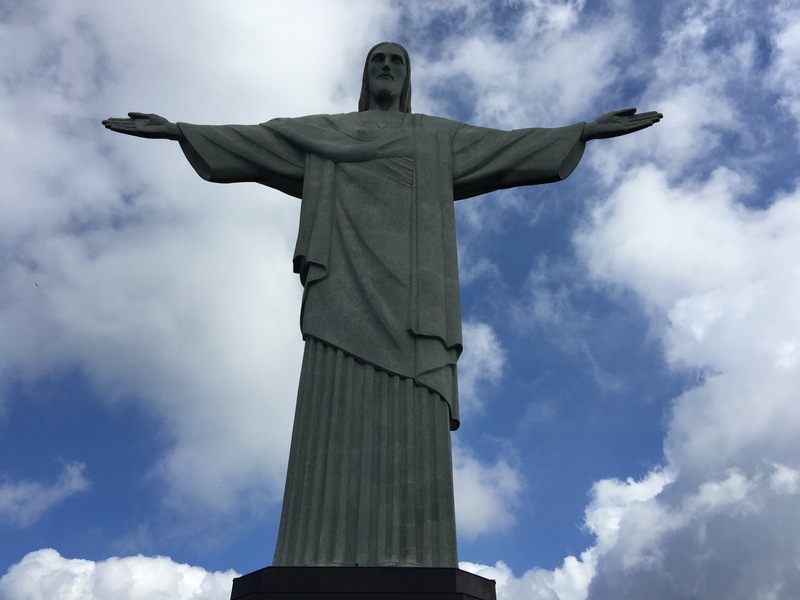 The statue stands at 30 metres (98 ft) tall from it’s 8-metre (26 ft) pedestal, with its arms outstretched 28 metres (92 ft) embracing the people of Rio. As one of the Seven New Wonders of the World, expect huge crowds, so if you’ve got time on your hands it is best to visit early in the morning on a week day. There are several routes to the top, the most popular is to take a tour bus or taxi to cable car station and then take a local national parks bus which costs R$39.00 (low season) R$49.00 (high season) – this includes round trip and entrance to Christ the Redeemer platform. Our day trip included a short ten minute stop at arguably the most famous stadium in the world. 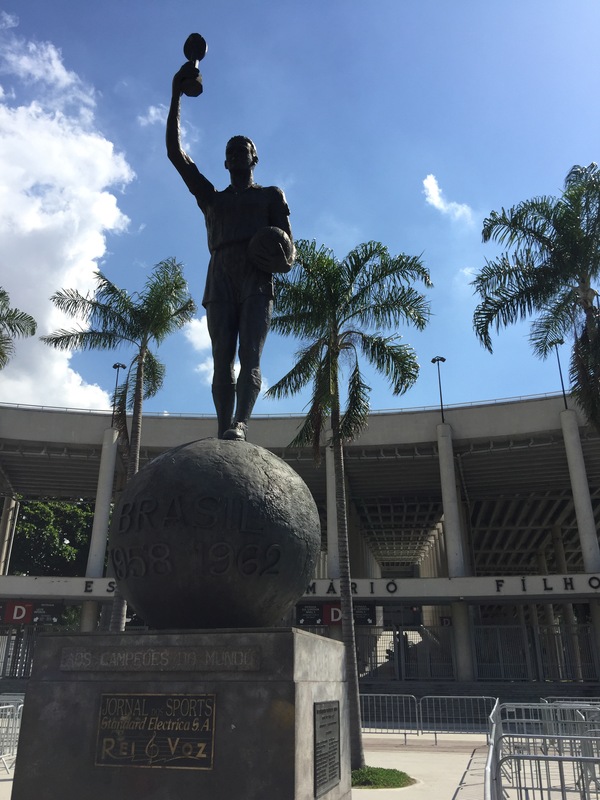 Unfortunately, since the Olympics the stadium has been closed for tours so a photograph outside is about as near as you’ll get to experience the magic of this sporting icon. The Carioca Aqueduct was built in the middle of the 18th century to bring fresh water from the Carioca river to the city, today it has been developed into a transport route through the city centre. 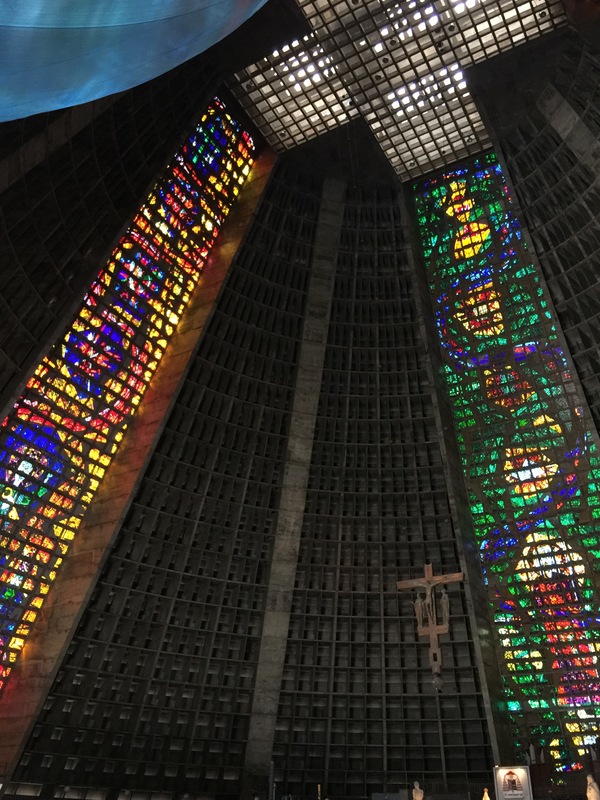 The Catedral Metropolitana do Rio de Janeiro has been the home of the Catholic Church in Rio, since completion in 1978. This vast modern building more closely resembles a lunar landing module than a church and features impressive stain glass windows. It can fit 5,000 people seated and up to 20,000 standing. 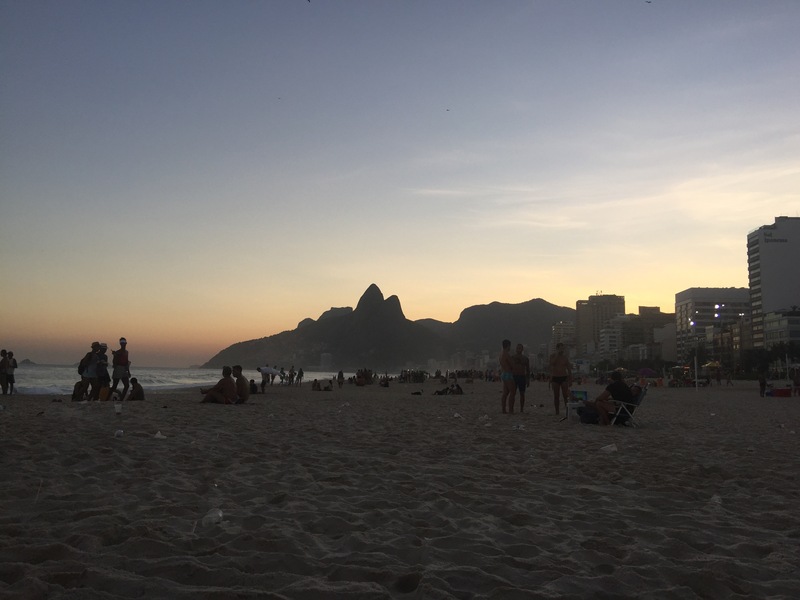 Ipanema is an affluent neighbourhood located in the South Zone of the city of Rio de Janeiro, between Leblon and Copacabana and is home to trendy bars and clubs. The beach has areas for all tastes, including families and those showing off a well bronzed body. Copacabana is arguably the most famous beach in the world, known for its 4 km of white sands, numerous cafes and bars and great swimming. The Monument to the Brazilian Soldiers of World War II, commemorates Brazil’s participation and losses in the Second World War (WW II) and is located in Flamengo Park (Aterro do Flamengo, Parque Eduardo Gomes), on Guanabara Bay. 9. Escadaria Selarón, also known as the ‘Selaron Steps’, is a set of world-famous steps in Rio de Janeiro, Brazil. They are the work of Chilean-born artist Jorge Selarón who claimed it as “my tribute to the Brazilian people”.